I suppose everyone has their favourite list of fishing quotes, but laid end to end few of us would have enough material to make a book from them, but Nick Lyons has managed it. 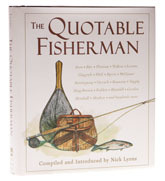 The Quotable Fisherman is a little unusual; something of a cross between a commonplace book of fishing and a book of quotes and it has a charm all of its own, like everything that Nick has anything to do with. I should add that the book itself is very well designed - it has a good feel in the hand. If you search for it on Amazon, you will gain the impression that the book is out of print, but as of May 2011, when I last checked, it was available from Skyhorse Press.